Do Swimmers Have the Best Bodies? Competitive swimmers have distinctive physiques that many people may consider an ideal body shape. They have defined upper body, lower body and abdominal muscles. They tend to have a low amount of body fat, resulting in flat bellies, defined backs and narrow waists. 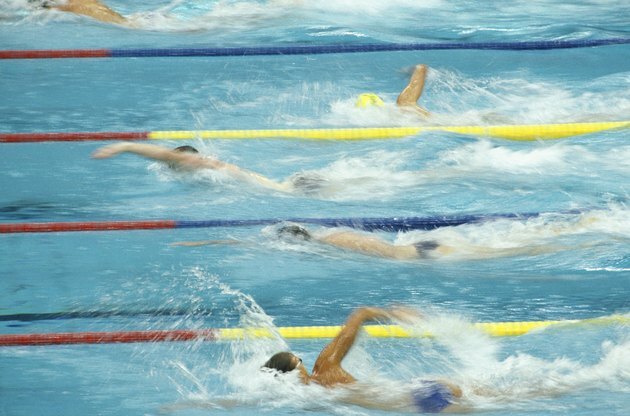 A typical swimmer's build has more muscular bulk than that of runners, who tend to be leaner and lighter. Many people aspire to have the lean yet strong body type of swimmers. The typical physique of a swimmer is muscular. Vigorous swimmers have toned arms, large shoulders and pronounced back muscles from doing strokes. Competitive swimmers have the added benefit of looking long and lean, because tall people tend to perform well in the sport. A typical male swimmer measures about 6 feet, 4 inches. Swimmers who compete in short-distance races tend to be taller and with larger muscles, because this body types gives them a speed advantage. Doing gentle water exercises or aqua aerobics does not burn a considerable number of calories, but intense lap-swimming burns between 511 to 673 calories per hour depending upon your weight and level of fitness. These calories burned are similar in nature to other vigorous aerobic activities like jogging, running slow, hiking with a weighted backpack, skating, playing singles tennis and aerobic dance. Working out at this level burns excess body fat at a rapid clip, resulting in maintaining a healthy weight or losing weight at a rate of 1 lb. per week. Unlike running or jogging, which targets mostly lower-body muscle groups, and weight-lifting, which often focuses on the upper body, swimming provides a full-body workout. The water creates drag and resistance, challenging you to engage your muscles as your propel yourself forward. Most strokes demand using your arms and legs as well as engaging your core to balance your body in the water. Vigorous strokes like the butterfly and the freestyle require your making broad arm motions while kicking hard. The classic swimmer's physique is often a V-shape, with a narrow waist and hips, broader shoulders and toned legs and arms. Many men and women aspire to have this body type, while others prefer the light and lean look of runners. If you appreciate a muscular, toned and athletic look, you may rank swimmers' bodies among the best of the athletic body types.